This post has been sponsored by Easy Bath Cheesecake Wrap. All opinions expressed are my own. Impress your guests with this decadent dessert made famous by Junior’s! 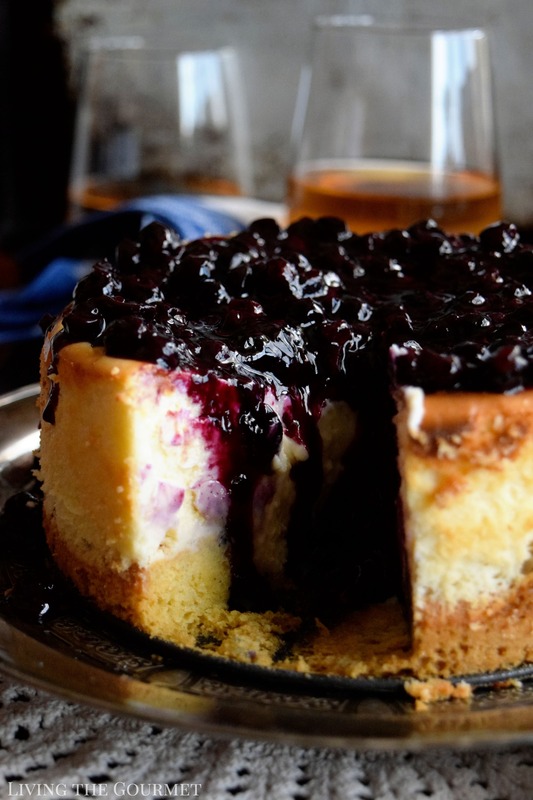 Topped with a Lavender Blueberry Sauce for a seasonal touch, this will become your new go-to recipe for cheesecake. If I may lift the veil for just a bit, I will admit that I was trying to be my usual esoteric self with the opening of this post, and to find some obscure quote to lead off with, which I would then spin into something relatable or personal. Yet, I just simply couldn’t bring myself to do so this time around. You see, when I think of cheesecake I think of two things. 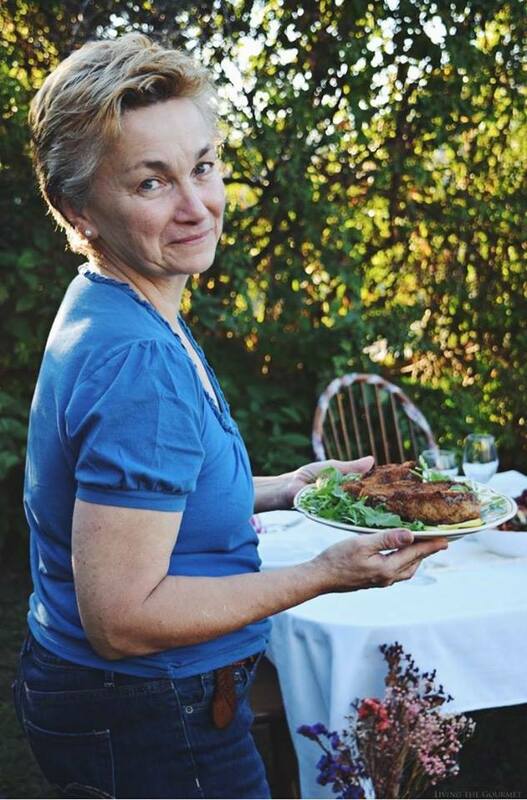 First, I think of balmy family dinners on my uncle’s barge – always balmy, somehow even in the winter months I remember the place being ‘balmy’ with the ‘porch’ door open overlooking the Great South Bay, or maybe that’s just a trick of memories formed in childhood. 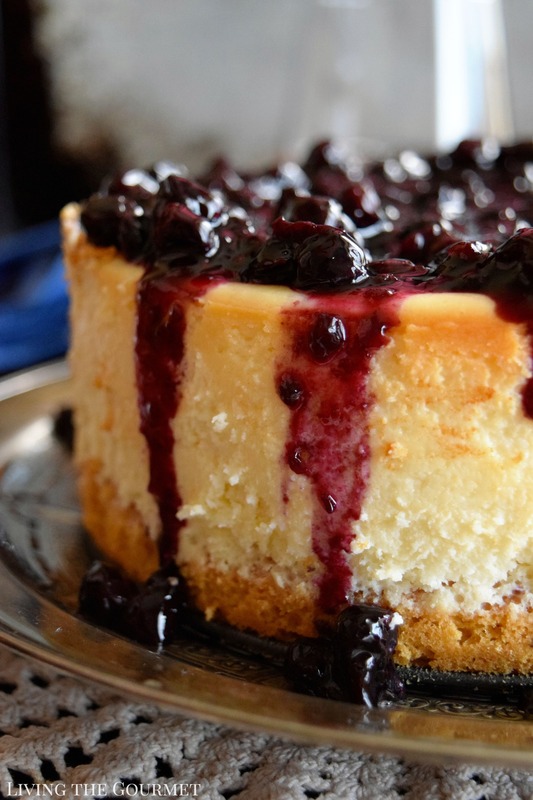 One of the fixtures of those dinners were cheesecakes brought home by my older cousin from Junior’s of Brooklyn, usually on his way back from work, and I still remember the big white boxes and the triple-wound bakery twine. 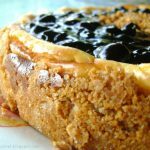 Other times the cheesecakes would come from a local diner whose owner was a friend of the family, and whose baker was beyond stellar at the time – also a friend of the family. The second thing I think of is, admittedly, the Golden Girls sitcom and the running trope of the four women collectively loving cheesecake. Anyway, simply put, cheesecake has been a fixture on my family’s dessert table for longer than I’ve been alive. Was it some intentional family tradition or act of heritage? Certainly not. Cheesecake was simply our dessert of choice for ‘any event.’ While things like grain cakes and rum cakes required either special events or daylong baking sessions, cheesecakes of decent quality on the other hand were readily available for purchase – and everyone loved them. 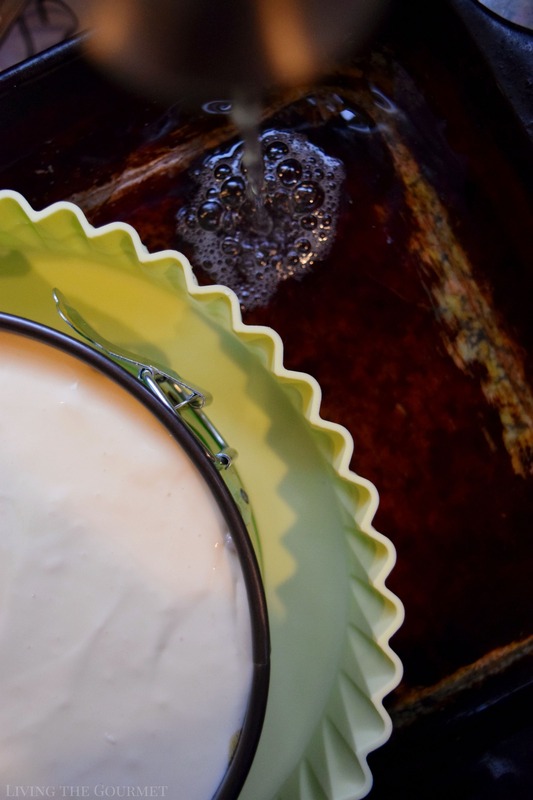 That being said, these days I’ve become a bit fonder of making my own as opposed to purchasing them – and that’s precisely where today’s recipe comes in, a Sponge Crust Cheesecake. 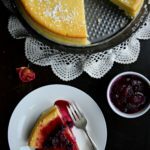 I’m using this as an opportunity to show off a new piece of kitchen equipment, one I didn’t even realize I needed until it was brought to my attention, The Easy Bath Cheesecake Wrap – more on that in a bit. To start things off we begin with the crust. We begin by beating together egg yolks, sugar, and the extracts listed below until it’s nice and thick, then fold in the ingredients and melted butter. Set that aside and whisk together egg whites with cream of tartar until it is frothy as shown below. Then add in the sugar and continue beating until stiff peaks form from the whites. Fold in this egg white mixture into the previous mixture with the egg yolks, and continue folding until the batter combines, at which point pour it into the prepared baking pan and bake for about ten to twelve minutes until the crust has set. Now, onto the cake itself. In a mix master with a paddle attachment, beat eight ounces of cream cheese with corn starch, vanilla, and sugar until its creamy smooth, then add another eight ounces of cream cheese, mix again, and then add another eight ounces of cream cheese and mix a third time. Now, do the same thing we the eggs, adding them at a time and beating between each. Then, with the mixer on low speed, slowly add in the cream. Once that’s done, pour the resulting batter into the cooled crust in the springform pan, and then transfer that to the Easy Bath Cheesecake Wrap. 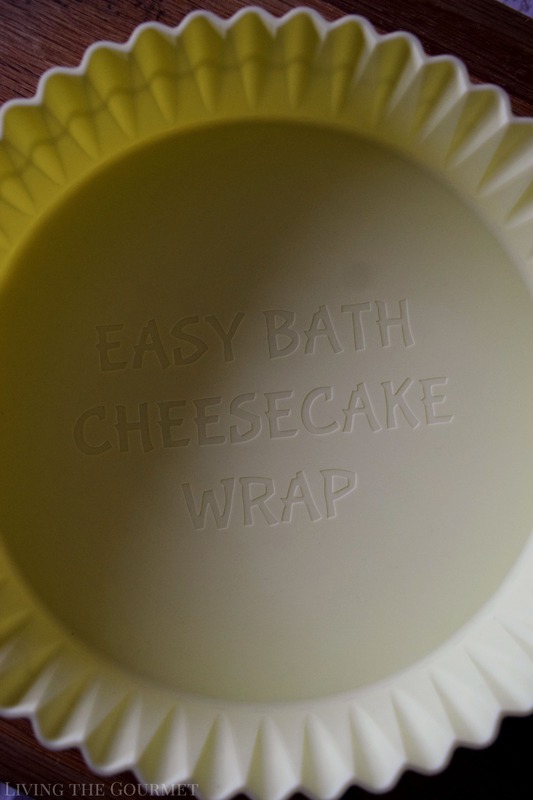 This is where my new piece of kitchen equipment comes in – the Easy Bath Cheesecake Wrap. In essence, this takes all of the mess and fuss out of using the water bath cooking method for your cheese cake. Simply slip this around the springform pan of your cheesecake, and then place it directly into the water bath. No mess, no fuss, it is reusable, oven-safe, and food grade. From the pictures below, you can see that this is a breeze to use and does exactly what it promises. With the cheesecake in its water bath, bake for about forty minutes, or until it is slightly golden and middle only barely jiggles. Then simply remove the cake from the water and let it cool on a wire rack until room temperature. Preheat oven to 350 degrees F. and grease an 8-inch springform pan. Set aside. In a small bowl sift together flour, baking powder and salt. Set aside. In the bowl of your mix master with whisk attachment, beat egg yolks, 2 tablespoons sugar and extracts until thick. Fold in the dry ingredients and melted butter. Set aside. Whisk egg whites in a separate bowl and beat with cream of tartar until frothy. Add in the remaining sugar until stiff peaks form. Fold the beaten egg whites into the egg yolk batter until a light batter comes together. Pour the batter into the prepared baking pan and bake for 10-12 minutes until crust has set. Do not let it overbake. Remove from the oven and let cool while preparing the filling. In the bowl of your mix master with a paddle attachment, beat one package of cream cheese with cornstarch, vanilla and 1/3 cup of sugar. Once smooth, add the rest of the cream cheese, one package at a time, beating between each addition. Add the eggs, one at a time until the batter is thick and smooth. On low speed, gradually add the cream. Pour the batter over the cooled crust. 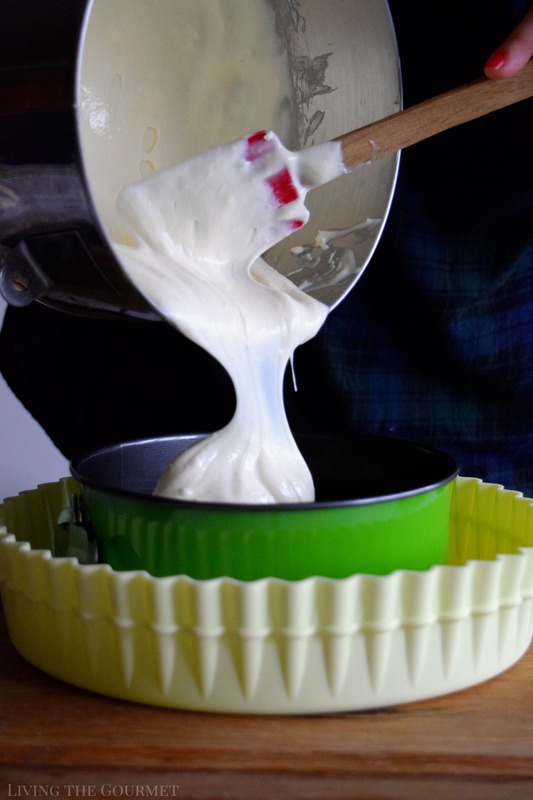 Transfer the pan into the Easy Bath Cheesecake Wrap and place in a deep baking dish. Add water halfway up the sides of the wrap and place in the oven. Bake the cheesecake for about 40 minutes or until slightly golden and the center barely jiggles. Remove the cake from the water bath onto a wire rack and let cool until room temp. Once the cake has cooled, gently press clingfilm to the top of the cake and transfer to the refrigerator and chill until the cake has completely set. In a small saucepan, bring all ingredients for the topping to a boil until the berries have opened and thickened into a sauce. Let cool before transferring to a jar and refrigerate. 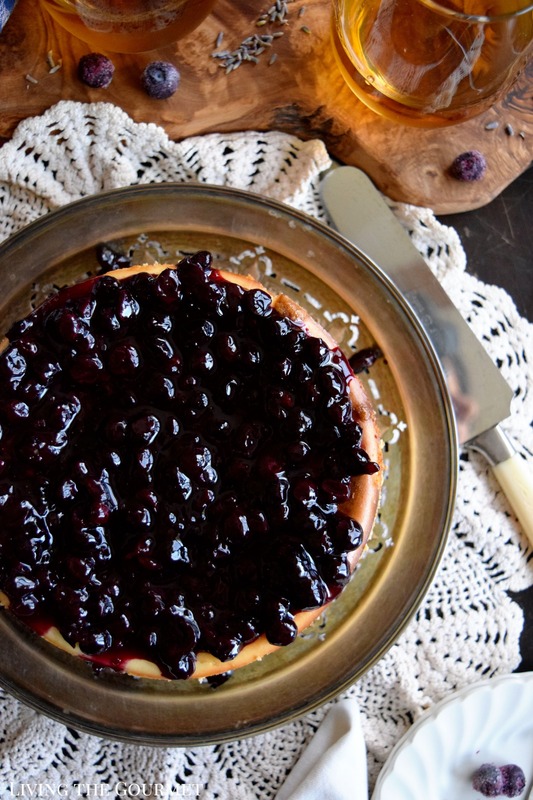 Before serving the cheesecake, top with the blueberry lavender sauce. Serve and enjoy! 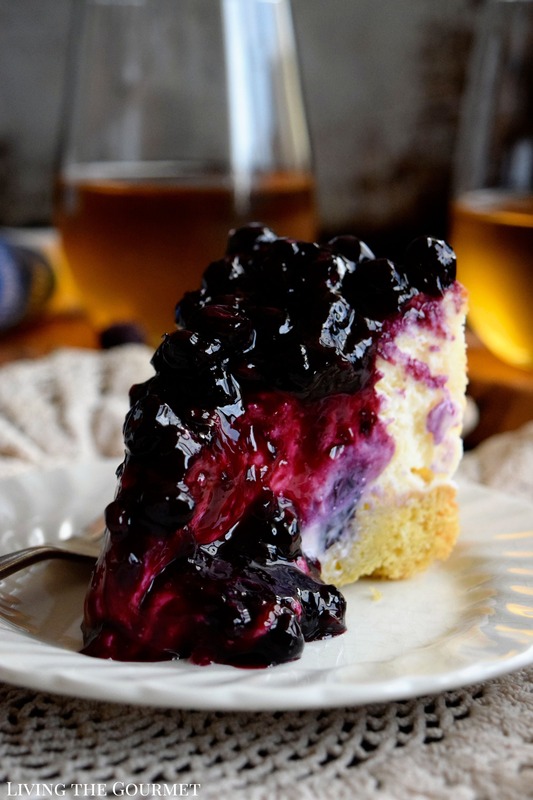 While the cake cools, prepare the Lavender Blueberry Sauce and top onto the cheesecake. Serve and Enjoy with Love! 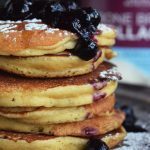 I'm NOT allergic to blueberries and this recipe sounds fabulous. What a treat to have a copycat of Junior's cheesecake. I will be making this to take to a friends house for dessert. Thanks for sharing! 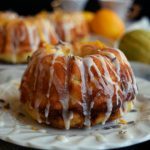 This looks beyond delicious and so very tempting with that lavender berry topping! I LOVE cheesecakes but always hate the whole water bath process. This is a great solution! I am drooling looking at that cheesecake. Wish I am brave enough to bake one for my family. Cheesecake is something that really scares me. I am so tempted to give your recipe a try. Oh man my Dad loves Juniors cheesecakes and has them shipped from NY! I can't wait to make this for him. What a great idea!! The water bath helper is fantastic. I always dreaded the mess that making a cheesecake in a water bath. All that aluminum foil and wrapping the springform pan. YUCK!! Your cheesecake is gorgeous - the lavender in it sounds wonderful. I will definitely give this a try. Oh my goodness... what a treat! I can't wait till my family's next special occasion... I'm totally making this!